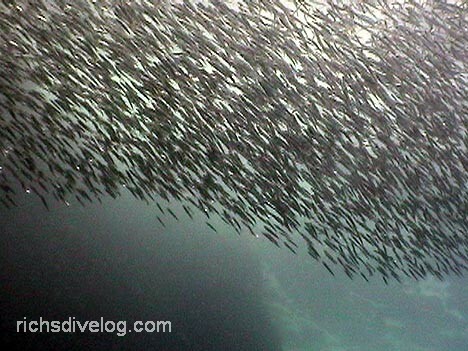 We spied large clouds of swirling silversides on this dive. Dive Journal: The dive this morning is around Guana Island, a site we’ve dove before called Times Square. There is a big squarish rock submerged here that names the dive. The rock formations here are very nice, very interesting, and it’s a good thing because there doesn’t seem to be much sea life here today. At one point we look skyward and see swarms of silversides above us, swirling in polarized patterns, and I stop for a while to video them, basically losing the group. It’s the best sighting on this particular dive, although there are also a few angelfish, snappers, and butterflyfish around. Still, a pretty spotted eagle ray eventually flies straight by me, but I am too slow with the video to get anything decent.